It had not happened if that child, often with shorts, not stops a day before the Museum of fien arts in their raids. At the door, outdoor, childen stayed self-absorbed watching paint to experienced artist at thair easels on the cobbled streets of San Agustín. I stopped running and stayed there all afternoon, surrounded by the magic of painting world. He thought that it was him because with he was born that sense of sensitivity essential in every artist. Today that child’s hair black and wavy, raised in the vicinity of the Plaza de la Merced, flooded his artistic feeling in paintings and his pictures conquer the admiration of all. He - who was going to say- is the heir of the Malaga painting of the 19th century. That child is now the artist Leonardo Fernández González. Flowers, Easter themes painter, portraitist and Malaga streets full of taste and memories. As a child, in school, he showed his apprehension with the pencil. 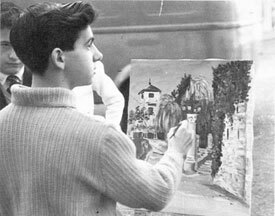 One day he participated in those outdoor painting competitions which the work union Educación y Descanso organized in different parts of the city and he won the first prize of 250 pesetas. This prize was given to him at the "Málaga Cinema. 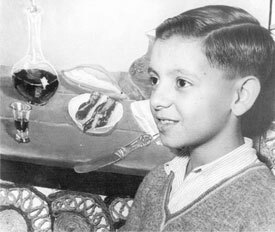 His teacher, Francisco Lopez Jimenez, who was a member of the Press Club, came to the newspaper ""Sur"to present the boy with justifiable pride. The newspaper did the first interview with Leonardo when he was 11 years old. The journalist boasted in his article of the discovery "We want to announce that we have been the first to speak in block letters about a born painter,of an artist that after two months of having taken his first brushes and colours handling each other with the ease that this Malaga born boy does, you can laugh at others. . Within days of the report being published a nice english fellow who called himself Mr. K. Piron appeared in the ""Sur"one of the last romantic travelers of our Malaga. Painter, art teacher, decorator and illustrator of magazine covers, he fell in love with Cózar Thomas Street. There he met Leonardo, who lived at number 25 of that street.. The visit of the english man at the newspaper was the subject of another wide article: "He came to talk about the child painter Leonardo Fernandez - says the diary -, whom we had dedicated this space few days back, and to fight over the supremacy of the discovery which we boasted in those columns." . After some pieces about his romantic and exciting life, Mr. Piron speaks about Leonardo: "He has great natural talent. I have limited myself to give him some tips. He is a second Picasso". The Englishman asked the journalist to put on record "for tomorrow" "that he was the one who discovered Leonardo". In the decade of the sixties, Leonardo Fernandez studied at the School of Arts. He learned the first steps of the technique, filling his notepad with drawings of noses, feet and hands. He had Marin Zaragoza as a drawing teacher and Juan Baena as the painting one, who was a student of Nogales. From here he was influenced for all paintings related to Malaga. Baena used to say "Copying a good painting is having a ten year advantage on the rest." That sentence got stuck in Leonardo's mind. By imperative need, at the age of 14 he started working. He was an apprentice in a bakery called "Angladaand he learned the mastership of the confectionery. From here used to come out the best sweets and cakes for the " Pez Espada Hotel, at the peak of the tourist "boom". He then moved to "La Imperial "where he continued with the art of this noble profession. In 1976 he attended an international conference on pastries in Barcelona, along with the world's most prestigious bakers. Leonardo presented a cake on a view of Malaga from Gibralfaro, through a typical fence. The jury was amazed by the work presented by Leonardo because more than just a simple cake it looked like an oil painting. He was awarded with the top prize, the "Alimentaria 76" medal. 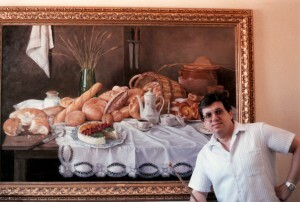 He made compatible his work at the bakery with the painting, which he never abandoned. In his free time he used to go to the Art Museum to study carefully the painting related to Malaga. Here he developed the memorable advice his teacher Juan Baena gave him and made a copy of the painting "La meta sudante"by Moreno Carbonero. He had an advantage of ten years and he had overcome the challenge of copying a great painting. They say that behind every artist there is a woman, and there is one behind Leonardo Fernandez. Backed by Loli and their two children, the artist reached his professional maturity. After losing his skills in baking, Leonardo loses all enthusiasm for this occupation and gives an important and trascendental step of leaving the pastry business and dedicates body and soul into what he loves the most: painting. In his apartment in the neighborhood of La Luz he locks himself for hours to create. He loses himself completely in front of the canvas. 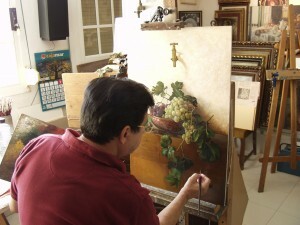 He spends whole days amidst oil paintings, easels and brushes. nothing and no one can stop him. After one year of intensive work he puts up his first exposition in July 1989, after eight years of artistic absence in Malaga. It is a complete success. Without becoming careless, he refines even more his technique, he takes more risks and dominates the light in all its fullness. He is reaching fame and his name begins to be quoted. Leonardo's struggle has been finally been rewarded. Difficult times are left behind. Leonardo Fernández has been written much and well. His impeccable career has enjoyed from criticism of prestigious writers. His painting oozes malagueñismo on all four sides and is thanking him the continuity of the Malaga painting of the 19th century in their brushes. The costumbrista painting that takes us back to a time of splendour in this matter. His first public dalliance in this world, earned him in 1975 the first praise of Guillermo Jiménez Smerdou in the “Ideal” of Granada: is a name that should be retained in the memory. It is possible that surprised us with an interesting work as a whole. Copy of Moreno Carbonero demonstrates technique, knowlodge of colors, sensitivity. A year later, in the same newspaper, echoed of the portrait that Leonardo painted the kind for the Town Hall: "Leonardo is a young painter, who is working hard to make way and move. Conditions have for it. 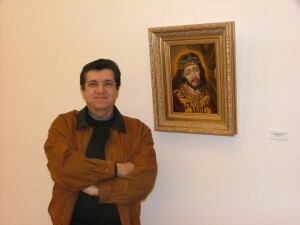 It is a conscious, secure guy, an exceptional copyist and, with the portrait of the King, has embraced a great success. The box measures one meter by eighty centimeters, The King appears on a countryside and cloudy sky. A great work that Malaga will have occasion to contemplate just visit the classroom sessions”. .
Rafael Cortés "Racor"newspaper "Surart critic for a long time, he said on one occasion: "“Leonardo puts us before a communication message on those important issues dealing with predilection, namely external and urban landscape, flower and portrait. Malaga street adjusted in light and shade and pleasant Outlook with absolute mastery of color; flowers to balances compositions, beautiful roses that gave gained in fluidity, ease and freshness, with enchantments poetic, reflexes and agile and simple funds”. .
Painting of Leonardo Fernández is not unnoticed by the Professor of the University and Diocesan director of religious art called Agustín Clavijo García, sadly deceased. "Painter of manifest vocation - said Clavijo- and incessant work, that from an early age has made his most intimate friends the brush and canvas. “From the lanscape, still life and manners theme, Leonardo has gone througt a complete range of figurative painting which has been full dominion over it”. . The brilliant journalist Gonzalo Faust, in one of their many highlights in "Sun of Spain"Wrote“Leonardo has great potential in urban landscapes, in those Malaga streets full of local colour, of an architecture which is going hand of victim of a devastating Spike”. . In 1976 Andrés García Maldonado already sense the success of Leonardo: “He is a great painter, that is already more than demonstrated. “We have no doubt that his works, despite his youth, will be already listed. Its quality and personality required as well. . Neither happens every day that an academic visit to an exhibition and to be impressed by the exposed paint write the painter, on its own initiative, a dedicated poetry. put yourself aside, and even the glass of water. about beds with strange cloths. ¡Your painting, I liked very much, much! as always, until now, bodies and souls!”. 1981: Caja de Ahorros Provincial de Málaga. 1989: Gallery Benedito of Málaga. 1990: Exhibition at the Gallery Benedito of Málaga. 1991: Exhibition at the Gallery Benedito of Málaga. 1991: Gallery Benedito of Málaga. 1992: Exhibition at the Gallery Benedito of Málaga. 1993: Gallery Benedito of Málaga. 1994: Gallery Elvira of Granada. 1994: Exhibition at the Gallery Benedito of Málaga. 1995: Exhibition at the Gallery Benedito of Málaga. 1995: Gallery Benedito of Málaga. 1995: Gallery Elvira of Granada. 1996: Stand at Artesur Xauen Gallery of Granada. 1996: Exhibition at the Gallery Benedito of Málaga. 1997: Gallery Xauen of Granada. 1997: Gallery Nova of Malaga. 1997: Gallery Terra Ferma of Lleida. 1998: Gallery Mar of Barcelona. 1998: Stand at Artexpo by the Grup Art Gallery School of Barcelona. 1999: Gallery Arimany of Tarragona. 1999: Stand at Artexpo by the Grup Art Gallery School of Barcelona. 2000: Gallery Terra Ferma of Lleida. 2000: Stand at Artexpo by the Grup Art Gallery School of Barcelona. 2000: Gallery Mar of Barcelona. 2001: Gallery Mar of Barcelona. 2002: Gallery Salduba of Zaragoza. 2002: Anthological exhibition at the Cajamar Hall of Málaga. 2002: Gallery Terra Ferma of Lleida. 2002: Group exhibition “XV Salon of autumn” of the Association of the press of Malaga at the Cajamar Hall of Málaga. 2003: Gallery Salduba of Zaragoza. 2003: Gallery Mar of Barcelona. 2004: Gallery Terra Ferma of Lleida. 2005: Gallery Arimany of Tarragona. 2005: Gallery Mar of Barcelona. 2006: Gallery Salduba of Zaragoza. 2006: Gallery Terra Ferma of Lleida. 2007: Anthology exhibition at the public school “Los Llanos” from Álora, on the occasion of its cultural week Andalusian. 2007: Gallery Arimany of Tarragona. 2007: Gallery Mar of Barcelona. 2008: Gallery Salduba of Zaragoza. 2008: Gallery Terra Ferma of Lleida. 2009: Gallery Arimany of Tarragona. 2009: Gallery Mar of Barcelona. 2010: Gallery Salduba of Zaragoza. 2010: Gallery Terra Ferma of Lleida. 2011: Gallery Arimany of Tarragona. 2011: Gallery Mar of Barcelona. 2012: Gallery Salduba of Zaragoza. 2013: Group exhibition at the Art Gallery of Granada La Zubia. 2014: Group exhibition at the Art Gallery Milenium of Granada. 2014: Del Benitez Art Gallery and Barber of Castellón. In April 1976 he delivered to the city of Malaga a great portrait oil of S. M. Don Juan Carlos I, which has been presidiento all the plenary sessions and the major social events of the municipal corporation. Months after this year, Leonardo completed another portrait of the King of Spain to Cerrado de Calderón school, after the success obtained with the earlier portrait. For this teaching centre performs then other works. Special orders the simultaneous work of restoration for private collectors and other official centres. 1990: The Andalusian Flamenco Foundation of the city of Jerez de La Frontera in Cádiz, acquires the work “Patio Andaluz”. 1991: He publisched an almanc with a title “Products la Canasta”oil. 1992: He published an almanac with a title “Sale of bread” oil in the 1920s in the Corach. 1993: He publihed an almanac with a title “Breakfast basket” oil. 1995: Portrait for the H. e. Ms. Margarita Mariscal de Gante. 1996: Drawing for the cover of the number 17 in the journal of Arts and Letters “La Traiña”, published in Marbella. 1998: Publishes an almanac with an oil painting of “Products basket”. 1999: South of Málaga newspaper publishes a range of an oil painting of title “Malagueña” on the occasion of the fair in August. 2000: Logo for the human rights of the Red Cross of Catalonia Cabinet. 2000: He collaborates on the cover of the book “Malaga convent” of D. Francisco José Rodriguez Marín. 2001: South of Malaga newspapel publishes a Christmas of an oil painting of title “By removing the Snowflake”. 2001: VIII the old book and opportunity fair poster. 2001: Representative of origin Malaga wines poster. 2001: Oil for Fernando Hierro on the occasion of his appointment as Malagueño in the 21st century. 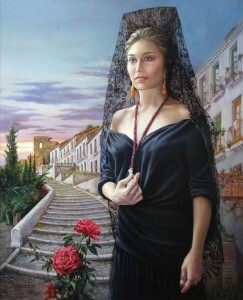 2002: Oil for the "Cartel XXVII arrows city of Malaga National Contest"being the model Diana Navarro. 2002: Home page of the catalog of the week legal malacitana. 2002: Newspaper South of Malaga published a Christmas of an oil painting of title “By placing the Bethlehem”. 2003: Newspaper South of Malaga published a Christmas of an oil painting of title “Christmas in Malaga”. 2004: Oil el Poster of the XXVII exaltation of MantleFor the Pro-Traditions Malagueñas The Coracha, being the model Association Estrella Morente. 2004: Newspaper South of Malaga published a Christmas of an oil painting of title “Goog year for all”. 2005:Poster for the celebration and polling on the day of the flag to the Red Cross. 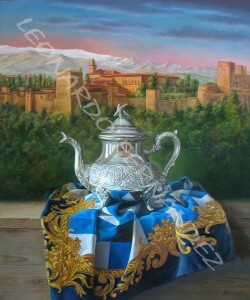 2005: South of Malaga newspaper publishes a Christmas of an oil painting of title “Illusion”. 2006: South of Malaga newspaper publishes a Christmas of an oil painting of title “Christmas print”. 2006: The excmo. City of Malaga takes on the work’s title "Cinema"to form part of their cultural heritage. 2007: The magazine “El Avisador Malagueño” in its number on May 15, 2007, reproduced on its Cover the oil painting entitled “Homepage to Picasso”. 2007: The newspaper South of Malaga publishes a range of an oil painting, on the occasion of the August fair. 2007: The Excmo. Fuengirola City Council responsible for portraits of the last three mayors from the democratic era until today: D. Manuel Delgado Perea, D. Luis Pagán Saura and D. Sancho Adam Valverde. 2007: The newspaper South of Malaga published a Christmas of a pen drawing. 2008: He has made Official Poster depicting the Holy Week of Malaga. 2008: Logo for the cultural association “Encuentro Cofrade”. 2008: Drawings for the historical of Alora dictionary and its municipal, written by José Morales García. 2008: Southe of Malaga newspaper published a Christmas of an oil painting of title “Peace on Earth”. 2009: Particular copy of the work "Execution of Torrijos" custom..
2009: Drawing in pencil to the flap of the book “Black and White”, about Alora, written by José Morales García. 2009: Newspaper South of Malaga published a Christmas of an oil painting of title “Christmas on the sea”. 2010: Newspaper South of Malaga published a Christmas of an oil painting of title “Illusion of Christmas”. 2011: Newspaper South of Malaga published a Christmas of a pastel drawing of title “Illusion”. 2013: Newspaper South of Malaga organizes an exhibition of Malaga goats. 2013: Commissioned by a Malaga goat by the retirement of the medical Don Federico Soriguer..
2013: Newspaper South of Malaga published a Christmas of a pencil drawing. 2014: The Southern Journal publishes Málaga Christmas a pastel drawing. 2015 : El Diario Sur De Málaga publica un Christmas a pastel drawing. 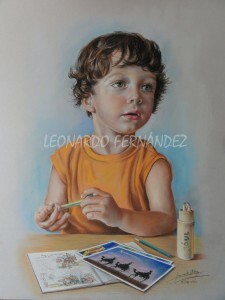 From 1982 until today Leonardo Fernandez has made for the brotherhoods and brotherhoods of Easter numerous paintings. Let us mention here, by way of example, the banners to Nuestro Padre Jesús del Rescate, María Santísima de Gracia, Nuestro Padre Jesús de la Columna (Gitanos), Nuestro Padre Jesús de Viñeros and Nuestra Señora del Traspaso and Soledad de Viñeros; Santísimo Cristo de la Vera-Cruz (Campillos) and and Virgen de la Hermandad del Calvario (Marbella). Also he has made a painting depicting the Annunciation of the Virgin for the roof of the Palio of the throne of María Santísima de Gracia. 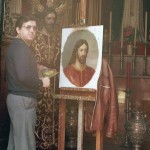 Within is wide production artistic on religious subjects, Leonardo Fernandez is the oil painting that presides over the altarpiece of the chapel of the brotherhood of the Column in the parish of the Holy Martyrs. This painting despicts the patrons of Malaga San Ciriaco and Santa Paula. To see the relationship of works made for the brotherhoods of Easter on the banner section banner section. Collectors of Malaga and outside our province have with the painting of Leonardo Fernandez, distributed at various points of our geography.